With nearly two days elapsing since the counting of poll results began, the Pakistan Tehreek-i-Insaf (PTI) has retained its considerable edge over its contenders, bagging 115 of the total 270 seats on which elections were held, according to the preliminary results announced by the Election Commission of Pakistan (ECP). The PML-N is a distant second, leading on 64 seats, while the PPP has won 43. The Muttahida Majlis-i-Amal (MMA) ─ an alliance of multiple religious parties ─ has managed to secure just 13 seats. Independent candidates have won 12 spots in the National Assembly, while the MQM-P has six seats to its name. The PML-Q, meanwhile, has won four seats, and the Balochistan National Party (BNP) and Grand Democratic Alliance (GDA) have grabbed two seats each. Balochistan Awami Party (BAP) has three seats, while Sheikh Rashid’s Awami Muslim League (AML) and Awami National Party (ANP) each have one seat. The national voter turnout for the polls was 51.85 per cent, an additional director of the ECP announced in a press conference. He added that the turnout in Balochistan stood at 44.79pc, at 45.52pc in KP, 55.9pc in Punjab and 48.11pc in Sindh. 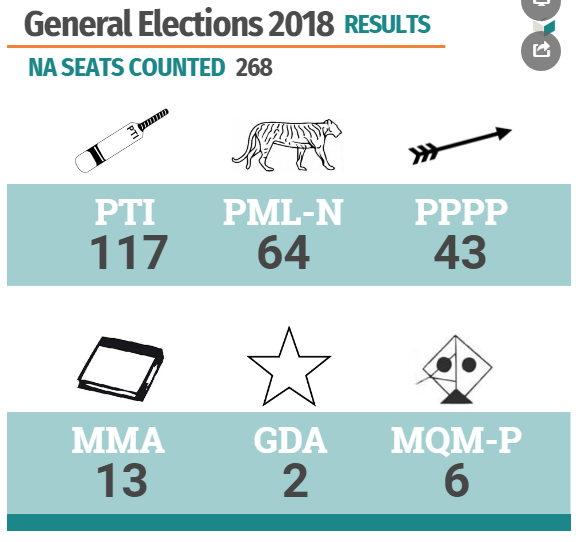 Despite performing poorly nationwide, the PML-N has emerged as the largest political party in Punjab with 127 seats, followed by the PTI (123 seats). Independent candidates have won 29 seats in the province, while PML-Q has won seven. The PPPP has only won six seats in Punjab while PML-F, Jamshed Dasti’s Awami Raj Party and Balochistan Awami Party (BAP) have won a seat each, according to the ECP. The PPPP appears set to form government in Sindh for the third consecutive term. The party has won 74 seats in the Sindh Assembly while the PTI has edged past MQM-P to emerge as the second-largest political party with 23 seats to its names — mostly from Karachi. MQM-P is in the third position with 16 seats while GDA — a newly formed alliance of parties in the province — has won 11. Tehreek-e-Labbaik Pakistan (TLP) and MMA have won one seat each. BAP has won 14 seats in Balochistan Assembly, becoming the largest party in the province, while the MMA is in the second place with nine seats. Akhtar Mengal’s BNP has won five seats in the province while the PTI has won four. PTI has dominated electoral proceedings in KP, bagging a whopping 67 seats, followed by the MMA which has only managed to win 10. The ANP’s seat tally stands at six while the PML-N has won five. The PPPP has won four seats in the KP Assembly.